In November, most of us turn our thoughts to big turkey dinners and first-wave English settlers in long stockings and buckle hats. Conventional Thanksgiving lore does give props to Massasoit and Plymouth-area Wampanoag for bringing most of the food to dinner. But the Pilgrims are only one part of the story. The Wampanoag Homesite at Plimoth Plantation depicts Native life vividly, but here are a half dozen museums that focus exclusively on the indigenous side of New England’s heritage. By the way, they are all closed on Thanksgiving, and some will soon close for the winter. In May 2016, the Abbe Museum unveiled “People of the First Light.” The new core exhibit takes its name from the term that many indigenous people of the Northeast — including the five nations of the Wabanaki Confederacy — use to describe themselves. They are the people of the sunrise, and the exhibit likewise marks a new day for the Abbe. Originally a small museum in Acadia National Park, the Abbe opened in 1928 to interpret Native artifacts found around Frenchman Bay. 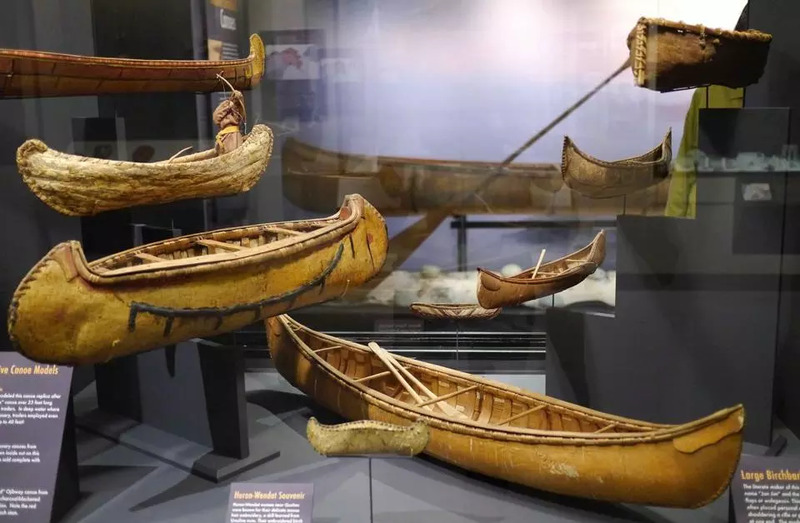 The modern downtown facility now tells a more comprehensive story of 12,000 years of indigenous culture in the Wabanaki homeland, and it does so from a Native perspective. Tribal historians, artists, and educators advised in exhibit development. Gina Brooks, a Maliseet artist from New Brunswick, created dramatic illustrations of legends and tales from the oral tradition that inform many exhibits. The Abbe’s science and ethnography remain as rigorous as ever, but learning about the continuity of indigenous culture in the voices of the people themselves brings an immediacy to the experience. 26 Mt. Desert St., Bar Harbor, Maine. 207-288-3519, abbemuseum.org. Open through April Thurs.-Sat. 10 a.m.-4 p.m., closed January. Free until Dec. 22. Otherwise, adults $8, seniors $7, ages 11-17 $4, ages 10 and under free. Founded by Charles and Nancy Thompson, the Mt. Kearsarge Indian Museum represents a singular vision of a master collector. Inspired by a school visit from Pequot sachem Silverstar when he was in the second grade, “Bud” Thompson amassed a major collection of artifacts and artwork representing tribes across North America. The museum sits in the homeland of the Abenaki (one of the five peoples of the Wabanaki Confederacy) and about a quarter of the collection represents peoples of the Northeast. Many works chronicle the growth of basketry and beadwork as Native economic mainstays in the late 19th and early 20th centuries. The contemporary art gallery features two exhibits each year guest-curated by members of the Native community. 18 Highlawn Road, Warner, N.H. 603-456-2600, indianmuseum.org. Open through Nov. Sat.-Sun. noon-5 p.m. Adults $9, seniors and students $8, ages 6-12 $7, family $26. Created in 1970, more than three centuries after the establishment of Mashpee as a “praying village,” this compact museum and cultural center occupies a circa-1793 half-Cape home in the historic heart of the Mashpee Wampanoag homeland. (Eighty-five percent of tribal members live within 20 miles.) It sits next to the historic Herring Run, where some Wampanoag still harvest fish in the early spring. This year the museum has seen a swell of visitors eager to learn more about the Wampanoag. One of the first things they learn is that Wampanoag culture finds many opportunities for thanksgiving throughout the year. The museum focuses principally on the post-1620 era, and on the contributions and achievements of Wampanoag people. A small but fascinating exhibit on Native American whaling is up this fall, but may be coming down next year. Although the museum closes for the winter on Dec. 1, off-season visitors can see a traditional round, bark-covered Wampanoag house on the grounds. 414 Main St., Mashpee. 508-477-9339, MashpeeWampanoagTribe-nsn.gov/museum. Open through Nov. Mon.-Fri. 10 a.m.-4 p.m. Adults $5, ages 6-18 $2, seniors and educators $4, family $10. You’ll meet a lot of indigenous people in the exhibits at this museum in the heart of Narragansett country. One display features two-time Boston Marathon winner Ellison “Tarzan” Brown. Another sketches the achievements of tribal historian Mary Glasko. Known as Princess Red Wing, she served as a delegate to the United Nations and co-founded the museum in 1958. The last living Narragansett sub-chief, 96-year-old Kenneth “Strong Horse” Smith, donated his turkey feather headdress and other ceremonial clothing for another exhibit. Connections span the generations. A beautiful circa-1850 Narragansett bark canoe hanging from the rafters comes from the family of executive director Lorén Spears. Continuity is omnipresent. Next to historic Narragansett baskets with now-faded stamped vegetable dye designs is a case showing how a contemporary basketmaker constructs a traditional basket. Everything in the museum seems to have a story, often including the name of the person who made it, wore it, used it, or passed it down. Each quarter, the museum showcases a different contemporary Native artist, many of whom sell their work in the museum’s gift shop. 390 Summit Road, Exeter, R.I. 401-491-9063, tomaquagmuseum.org. Open all year Wed. 10 a.m.-5 p.m. and Sat 10 a.m.-2 p.m. Adults $6, seniors and students $5, children $3. Filling an airy modern building in the woods near Foxwoods Casino, this museum pulls out all the stops to relate the history and flesh out the cultural nuances of what it means to be Pequot. An archaeological dig on the Mashantucket reservation places the earliest settlement as 9,500 years ago, just as the glaciers receded. But the exhibits quickly move on to more recent eras. When European colonists arrived, the Pequot were a prosperous nation that held sway over large parts of what is now Connecticut. Moving exhibits detail their near-extinction in the 17th century and their dwindling numbers and influence thereafter. This institution shines at teasing out the palpable resilience of people who clung to their identity through all forms of adversity. The exhibits are so thorough and compelling that it is easy to spend half a day here — a small investment of time to become acquainted with a people. 110 Pequot Trail, Mashantucket, Conn. 800-411-9671, pequotmuseum.org. Open through Nov. Tues.-Sat. 9 a.m.-5 p.m. Adults $20, seniors and college students $15, ages 6-17 $12. Nearby, the Mohegan Tribe operates a small museum with a diverse collection of objects from many Northeastern, Plains, and Southwestern tribes. Call the Tantaquidgeon Indian Museum (1819 Norwich-New London Turnpike, Uncasville, Conn., 860-848-3985, mohegan.nsn.us) ahead as opening hours can vary. Located on a wooded 15-acre campus in the Litchfield Hills, this museum has carried out more than 500 archaeological excavations in Connecticut since it was founded in 1975. The outdoor replica of an Algonkian Village is an especially evocative large-scale display of woodland life in the period 350-1000 years ago. The museum also works with all five state-recognized tribes (the Mashantucket Pequot, the Eastern Pequot, the Mohegan, the Schaghticoke, and the Paugussett) for contemporary programs. 38 Curtis Road, Washington, Conn. 860-868-0518, iaismuseum.org. Open all year Weds.-Sat. 10 a.m.-5 p.m., Sun. noon-5 p.m. Adults $10, seniors $8, ages 3-12 $6.